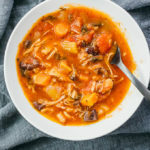 A fantastic recipe for hearty Italian Chicken Stew made in the Instant Pot pressure cooker. Low carb, keto, paleo, and gluten free. Select the saute mode on the pressure cooker for medium heat. Add olive oil to coat the bottom of the pot. When the display reads HOT, add onion, celery, and carrot. Cook for about 5 minutes to soften them, stirring occasionally. Add diced tomatoes including liquid in the can, chicken broth, basil, tomato paste, bay leaves, oregano, salt, and pepper. Stir to dissolve the tomato paste. Turn off the saute mode. Add chicken thighs and submerge them in the liquid. Secure and seal the lid. Cook at high pressure for 10 minutes, followed by a 10 minute natural release. Manually release remaining pressure. Uncover and use tongs to transfer the chicken to a plate. Discard the bay leaves, if desired. Turn on the saute mode for low heat. As the liquid simmers, use 2 forks to shred the chicken and return them to the pot. Add kalamata olives. Continue simmering until the liquid reduces to a stew consistency, about 10 minutes, stirring occasionally. Turn off the saute mode, and add salt and pepper as needed. Serve while hot. This recipe yields 7.5 g net carbs per serving (1 cup of stew or 1/4 of entire recipe).